It’s weird to hear Michonne talk so much. But, man, the things I’m learning about The Walking Dead’s dreadlocked enigma rattle me even more than hearing her speak. There are lots of reasons that Michonne is a favorite amongst fans of The Walking Dead. Both the TV and comic-book iterations of the character are steely and stoic, calmly dispatching walkers while others freak the hell out. She’s eerily aloof in the post-apocalyptic world that she inherited, too, and largely eschews the melodrama that other survivors get embroiled in. Michonne mostly keeps her feelings to herself, and it’s clear that great loss has turned her into a lethal introvert. 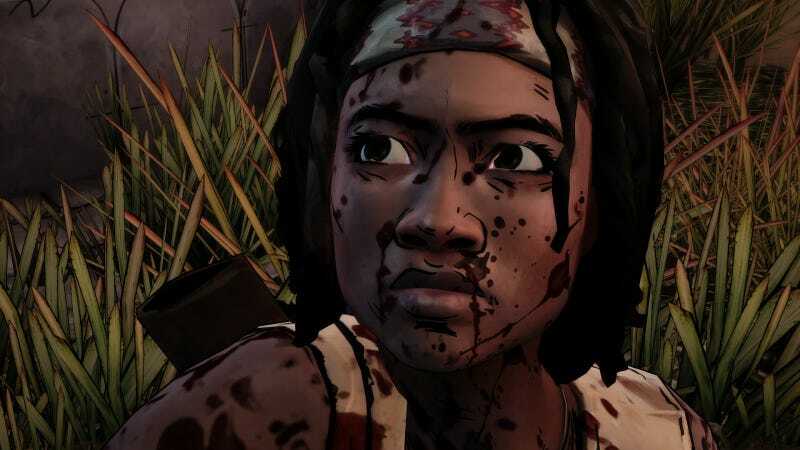 Out today on PC, PS4 and Xbox One, the first episode of The Walking Dead: Michonne miniseries shows players the moment that her seemingly implacable resolve was broken. The game opens with Michonne wandering through a wooded area, where she soon finds herself fending off a swarm of walkers. As players chop and dismember the undead attackers, the scene shifts to flashbacks of Michonne’s memories. These snippets of the past are haunted by two little girls, later revealed to be Michonne’s daughters. After the flashback ends, her guilt at not being at their side overwhelms her and the sword-wielding woman does something uncharacteristic: she picks up a gun. Michonne’s never been one to use guns on walkers, though. This firearm has a more disturbing purpose. Another survivor named Pete interrupts Michonne’s suicide attempt, and she joins the crew on Pete’s sailboat. Pete’s haunted by his own losses and is obsessed with the sudden silence of people he was trading with. After answering a random distress call on the shortwave radio, the next sequence has Michonne and Pete scavenging an abandoned ferry. They get into a skirmish with new characters Sam and Greg over a duffel bag filled with supplies, which attracts yet another swarm of walkers. Michonne, Pete, Sam and Greg all get overpowered by an armed squad led by a man named Randall. The four of them then get taken to Monroe, a ramshackle boating community run by Randall’s sister Norma. Once there, Michonne gets pitted against Sam and Greg as Norma interrogates them all to find out who stole from her. Episode 1 of Michonne demonstrates Telltale’s clever grasp on the logic of The Walking Dead universe, showing players a wave of walkers shambling underwater and then introducing a boating community that uses those deep waters to keep away from the undead. Like every enclave of human survivors in The Walking Dead, Monroe is a place where the best and worst traits of humanity come out in sharp relief. Telltale’s formula doesn’t feel worn out, and the choices you’ll have to make will fill you with dread and regret. The first episode of Michonne also shines by deepening the player’s understanding of its lead. Michonne’s a character who exerts control over every aspect of her life. Seeing moments when she relaxes her stony facade, as with the hints of a wary and flirtatious relationship with Pete, feels novel. The same goes for the instances when she’s at the mercy of others. I’m not used to seeing or thinking about her as someone helpless, and the sound of zipties being secured around her wrists made me shiver. The three-episode miniseries is seated in the continuity of the Walking Dead comic-book series during a time when Michonne split off from Rick Grimes’ community of survivors. We already know that Michonne’s going to be out on her own again. Learning more about the title character is the most compelling reason players have to jump into this miniseries, and the first episode is a gripping start of a journey into Michonne’s heart.